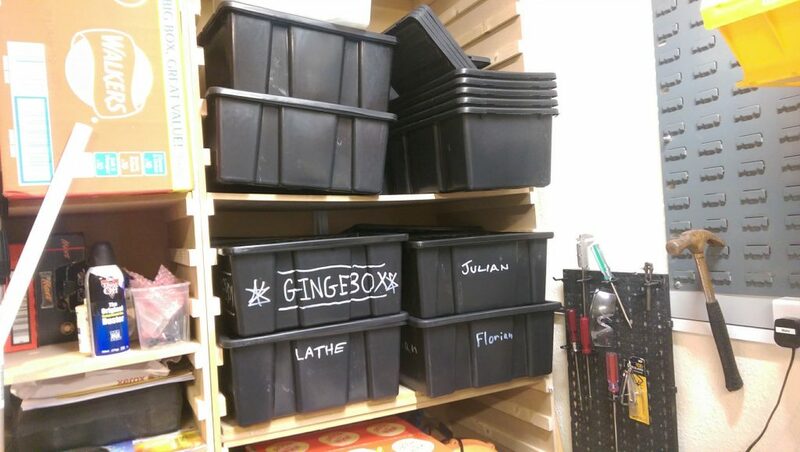 Our main work benches and shelving. 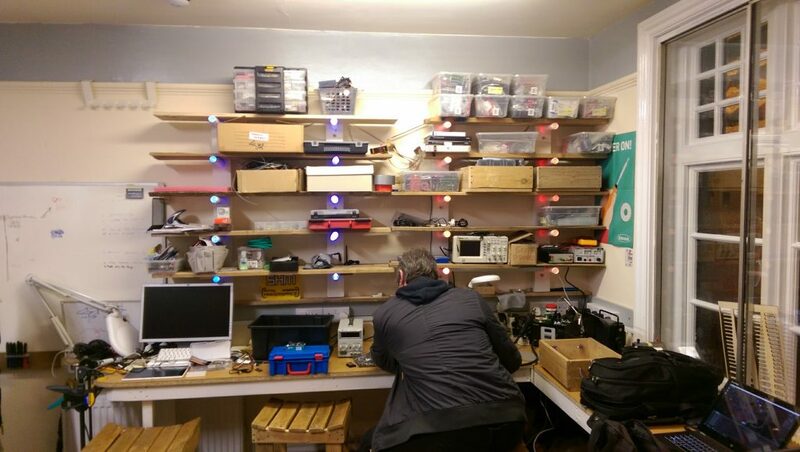 Note the LED shelving, each LED is individually addressable (you can control the colour and brightness), they’re waiting to join the IOT “Cloud” with the use of a Wemos (https://www.wemos.cc/) Maybe you can be the one to help progress this project? 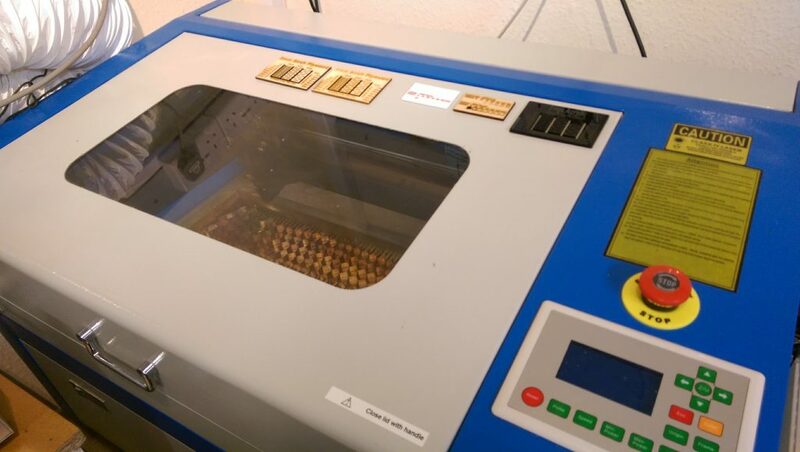 Our laser cutter, several members are now fully trained and have been starting to making various projects developing laser cutting and etching skills , they’re raring to pass these new skills on to other members. 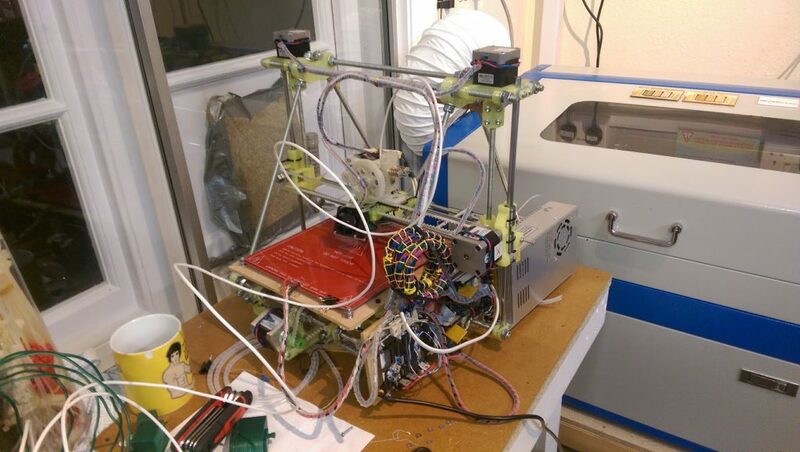 Our 3D printer has been tuned and fettled by a dedicated member. He has been printing parts for other members and it is pretty much ready to be opened up for general use by all members. 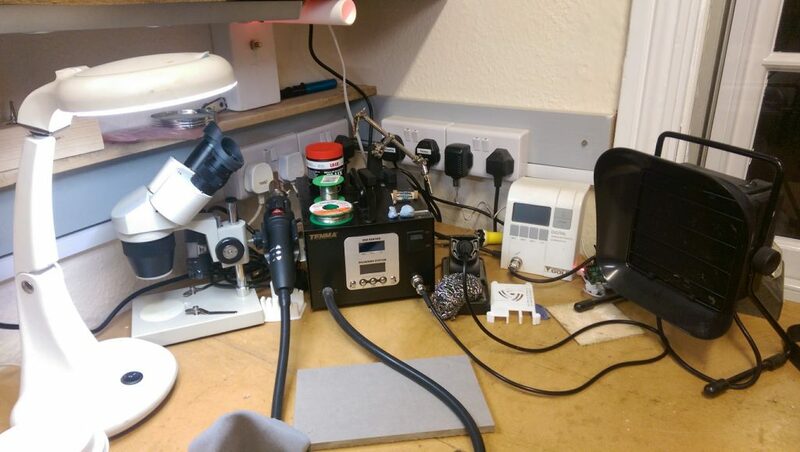 Our soldering station has been put to good use so far. We’re looking forward to the magnification, heat pencil and hot plate being used for SMD assembly. Our oscilloscope and meters are out of shot. 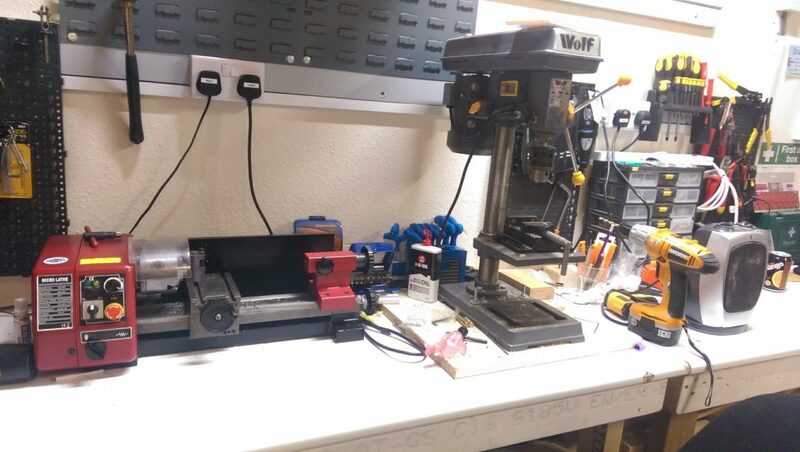 Our engineering area where all manner of turning and drilling has taken place. Member’s storage is starting to fill up with all kind of interesting projects and equipment. Our in house designed and manufactured (laser cut) cable storage rack. It you’re not a member come along on a Friday night to see the place for real! It’s been a busy few months for SHM! 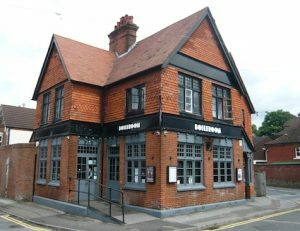 We’ve more or less completed our renovation works at the Boileroom and our members have started coming along regularly, working on their many projects. Our fancy laser cutter is installed, working and has already been producing a variety of projects. 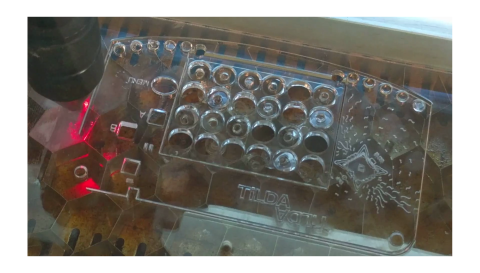 The laser cutter is a very nice addition, as (for those who don’t know) it is much faster at creating a variety of items – and from cheap materials, too. We’re looking to expand the machinery available to our members – one new potential addition is a milling machine, for creating all sorts of shapes out of materials like aluminium and steel. This is open to pledges, so if that’s something you’re interested in using or you’d like to know more, please visit the forum thread for more information. Next week will be our AGM, currently limited to our members. 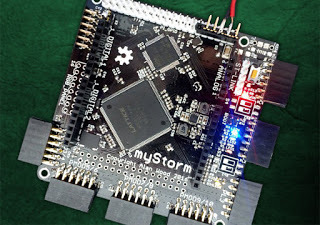 If you’re a member and want to come voice your opinions and help shape the Makerspace, do feel free to pop along – details are on the member’s area of our forum. If you’re not a member though, do please feel free to pop along to one of our Open Sessions! These run every Tuesday and Friday from around 18:00 onwards. 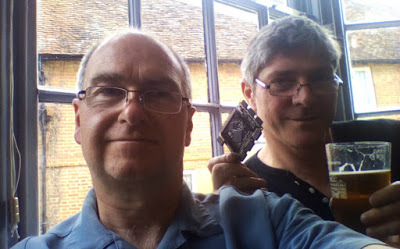 We often have all sorts going on, so if it’s a flying visit for a chat, you want to come see what a Makerspace is all about, or you have a project idea – feel free to pop along. We advertise our open sessions on our Forum, which is also bustling with lots more information on the ‘space. We’ve made fantastic progress with building our space over the last couple of weeks. The benches are now in, shelving is going up, and everything is really taking place. 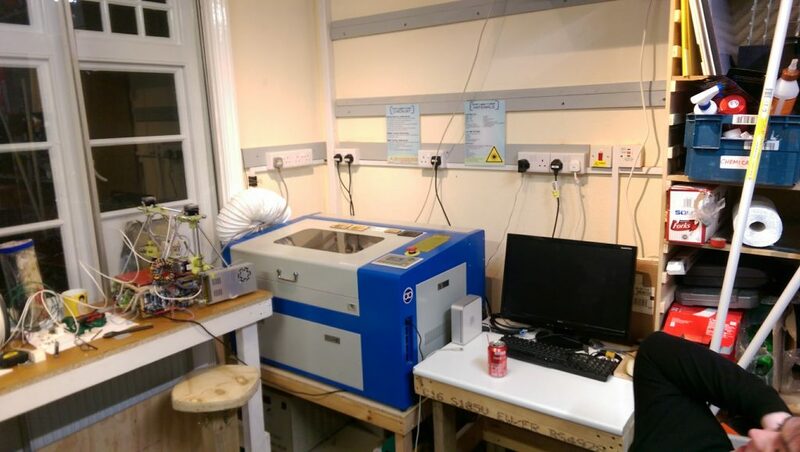 There are only a few items left for us to do, but it hasn’t stopped some of our members making already – we’ve had various personal projects turn up, as well as work being done to get our 3D printer and laser cutter up and running. 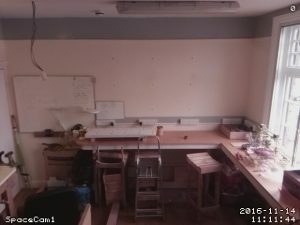 We also have a space webcam (featuring motion detection too!) for a bit of added security, and I hope to write a script that will allow us to create timelapse videos of our open sessions – which don’t forget, are every Tuesday and Friday. Do check the forum if you’re planning to pop in, as we update the ‘Open Sessions’ category when a keyholder is in the space. I’ll be there to open up at about 18:00. Just a little update for this week’s session. We’re still in the process of refurbishing our new space, so for now we’re sticking to just Friday for our open nights. 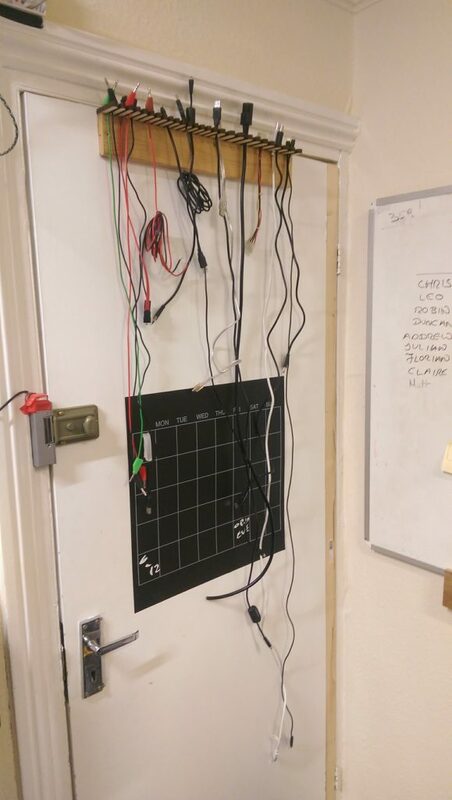 However, due to the somewhat chaotic state of the space at the moment (more hammers’n’saws than arduinos’n’laptops), we’re limiting it to members only for now. Obviously if you’re in the area you’re welcome to pop by and have a look, but I wouldn’t expect any fancy makerspacey stuff going on just yet. Come and see our 3D printing demonstration and peruse our selection of gift ideas and grab a cup of tea and scrumptious slice of cake at the same time! August is looking like another interesting month. A number of members are going to be attending EMF camp, and plans for a permanent space are advancing!